Happy New Year from all of us at Midwest Pinball! We hope that 2018 is a great year for everyone. For those considering a game for their home or business, we wanted to let you know that, even after the holiday rush, we still have fantastic games for sale. In the last blog, we highlighted three games and one of them, Bally’s Silverball Mania, was purchased. For this blog, we will highlight another set of three, fun-to-play games: Stern’s Meteor, Gottlieb’s Shaq Attaq, and Gottlieb’s Rack-A-Ball. 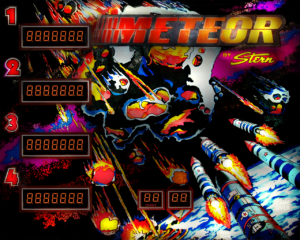 Stern’s Meteor pinball game was produced in conjunction with the movie Meteor by American International Pictures. The game came out as a promo for the movie which starred Sean Connery and Natalie Wood. The game features three flippers, one pop bumper, two passive bumpers, two slingshots, three star rollovers, three 3-banks of drop targets, one spinning target and one standup target. Meteor also features one 6-bank of memory drop targets. These special drop targets are held in memory and restored prior to each player’s next ball. The bank then increases the bonus multiplier and activates other features. This fun-to-play game was designed by Steve Kirk. Artists Leslie Kaip and Jorge Obregon drew their inspiration for the backglass and flyer from one of the movie’s advertising posters. This 4-player game has been configured for free play. Gottlieb’s Shaq Attaq gives players a real feel for basketball by sending the ball, through the air, toward a moving basket. With this ramp jump challenge, players must shoot a ramp with proper timing to launch their pinballs and sink point-scoring baskets. The player plays as Shaquille in Events includeing: the Tip-Off, HORSE, the Alley-Oop, the Shot Clock, and Shatter the Backboard. 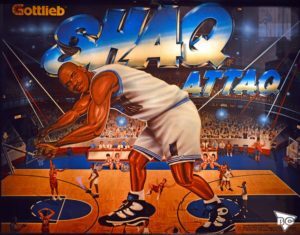 Shaq Attack is a fun game of pinball, complete with a Shaq Attaq Multiball and Hidden Features. The game has five “Hidden Features,” each of which is awarded after performing a certain feat in the game. An end-of-game bonus is given for the number of Hidden Features found; getting all five awards an extra one billion points. This solid state game was designed by Jon Norris and features art by Constantino Mitchell and Jeanine Mitchell. 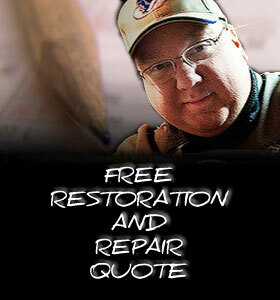 The game has been configured for free play. 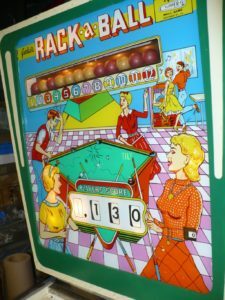 Gottlieb’s Rack-a-Ball is a classic 1960’s pinball machine. It features 4 pop bumpers, 2 slingshots, 3 standup targets, 5 ball play, 2 bells and a knocker for sound and five lanes at the top of the playfield. The game also features nice animation in the backbox – pool balls rack up in a window as the player completes the numbered targets on the playfield. This game features the great, clean artwork of Roy Parker. As the game is played, the lighting behind the glass highlights different characters. The back glass depicts characters playing a game of pool. Rack-a-Ball is replay game. Each game starts with five balls, but the players have an opportunity to earn free games throughout the game. This is a one-player game suitable for all ages. The game has been configured for free play.